An exploration of the impact of unintended consequences in an interdependent world and of the opportunities for creativity and community. We live today in a global web of interdependence, connected technologically, economically, politically, and socially. As a result of these expanding and deepening interdependencies, it has become impossible fully to control-or foretell-the effects of our actions. The world is rife with unintended consequences. The first law of human ecology-which declares that we can never do merely one thing-is a truth we ignore at our peril. 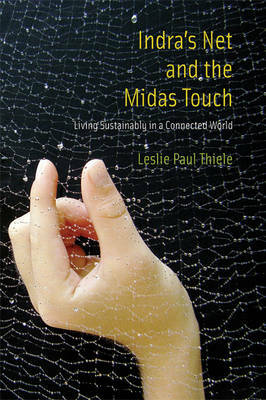 In Indra's Net and the Midas Touch, Leslie Paul Thiele explores the impact of interdependence and unintended consequences on our pursuit of sustainability. Unfortunately, good intentions provide no antidote to the law of unintended consequences, and proffered cures often prove worse than the disease. Biofuels developed for the purpose of reducing carbon emissions, for example, have had the unintended effect of cutting off food supplies to the needy and destroying rain forests. We must fundamentally transform our patterns of thinking and behavior. Thiele offers the intellectual and moral foundations for this transformation, drawing from ecology, ethics, technology, economics, politics, psychology, physics, and metaphysics. Awareness of our interconnectedness, he writes, stimulates creativity and community; it is a profound responsibility and a blessing beyond measure.